A curriculum hand crafted & certified by the Imam & teacher of the Prophet’s Masjid. The pioneering education system offered by Al Haramain Qur’an Schools is unlike that on offer from any other Qur’an school or Madrasah in the UK. We are dedicated to quality teaching of traditional Qur’an-related studies using the very best in modern technology, ensuring that exclusive innovation and interactive study materials enhance learning. Schools will be established with the aim of specialising in three distinct Qur’anic areas: The Science of Intonation (Tajweed), The Memorisation & Retention (Hifdh) and Perfection of Recital (Qira’ah). At Al Haramain Qur’an Schools we have two programmes to choose from: The Tajweed School and The Hifdh School. Our programmes are available to study on weekdays or weekends for boys and girls aged 4-16. Students who are able to read the Qur’an fluently and independently have the option of learning the rules of Tajweed in detail by studying it through classical texts combined with Hifdh (memorising the Qur’an) in a structured manner on the Tajweed School Programme or they can focus solely on memorising the entire Qur’an by heart with accuracy and Tarteel (melodious tone) on the Hifdh School Programme. Students who are not able to read the Qur’an fluently will be required to register on the Tajweed School Programme. Upon successful completion of each year, all our students will receive a certificate from Al Haramain Qur’an Schools signed by the Imam of Madinah and have the opportunity of obtaining Ijazahs (certification/licence) on the programme path they choose to take. Al Haramain Qur’an Schools brings you a unique Tajweed program for children with the aim of producing high calibre reciters and memorisers of the Qur’an. From the initial stages of learning the Alphabets to learning the specialised rules of Tajweed, your child will be monitored and guided every step of the way. In this unique programme, children will study the phonetic sounds of the Arabic Alphabet with reading and writing, along with arts and craft activities, with great focus given to the correct pronunciation of the letters. They will then progress onto studying Al Qā’idah Al Nūraniyyah not just orally but through specially designed written exercises which will assess their understanding in order to read with fluency. Following that stage they will then progress to learn the rules of Tajweed through the classical texts; Tuhfatul Atfaal and Al Jazariyyah while focusing on memorising the entire Qur'an correctly and proficiently. With the combination of traditional texts, modern teaching methods and the latest augmented reality technology enhancing the learning experience, children will acquire authentic knowledge through a pioneering, state-of-the-art syllabus. Upon successful completion of each year, all our students will receive a certificate from Al Haramain Qur’an Schools signed by the Imam of Madinah and have the opportunity of obtaining Ijazahs (certification/licence) for memorising the entire Qur’an as well as the Tajweed poems Tuhfatul Atfaal and Al Jazariyyah. In Level 1, children will begin exploring the Arabic Alphabet through phonetic sounds with our bespoke Arabic phonetic sounds book, crammed with fun reading, writing, plus arts and crafts activities, your child will become accustomed with the formations of every letter and their correct pronunciations, an essential aspect of reading with fluency. Children will also learn the phonetic sounds through the Al Haramain Schools Arabic and English Nashīds which involves actions relating to each letter. Children (and parents alike) will have great fun learning vocabulary through our exclusive innovative and interactive augmented reality medium where you will see the Alphabets pop right out of the book! Your child will then move on to the Al Haramain Schools adapted Al Qā'idah Al Nūraniyyah, which is a specialised Qā'idah used throughout the Middle East. It incorporates learning Makhārij (correct pronunciation) and rulings in a unique repetitive rhythm enabling children to learn quickly. Furthermore it is written in the same typography as Al Mus-haf Al Madinah making the transition to reading the Qur'an ever easier. For homework, your child will be required to watch Al Haramain Word Formation Videos which summarise each lesson of Al Qā’idah Al Nūraniyyah through animation. Alongside learning to read, children will be memorizing Surahs from Juz 'Amma with careful monitoring on the correct pronunciation and application of the rules. This level is suitable for those children who are able to read with fluency. The students will become “friends” with the Arabic Alphabet by knowing every detail about them; where they live (Al Makhārij), what they are like (Al Sifāt) and what they like to do (Al Ahkām). The medium that will be used to teach the rules of Tajweed is the classical poem Al Tuhfat Al Atfāl which translates as ‘The Beginner’s Bequest’. It was written by Imam Al Jamzūri for children to not only study the rules of recitation but to learn them by heart through poetry. •	The Letter Lām in Nouns and Verbs. Students will be supported by our exclusive innovative and interactive study materials to enhance their learning. They will do age appropriate written exercises in which they will learn the meaning of the poem and the rules pertaining to Tajweed, the meaning of key Arabic words used in the poem and basic verb conjugation, practice handwriting, learn about the author and the history related to the poem and learn about the virtues and etiquettes of learning and teaching Qur’an. These exercises will ensure that your child has understood each chapter well and will enable him/her to be on the path to become a distinguished recitor of the Qur’an. Students will be continuing their memorization of the Qur'an and encouraged to memorise Tuhfat Al Atfāl with close monitoring for accuracy and fluency. After having established the rules pertaining to the recitation of the Qur'an, the student will now be ready to tackle the poem 'Al Jazariyyah' in Level 4. Al Matn Al Jazariyyah is a famous poem on Tajweed and it covers the rules in more depth in comparison to Al Tuhfat Al Atfāl. Students will cover these rules and chapters through our exclusive innovative and interactive study materials to enhance their learning. As the rules of Tajweed in this poem require knowing some Arabic grammar, the reading and writing exercises have been designed to support the student to understand how to apply the rules in any part of the Qur’an therefore facilitating him/her to become an independent reader of the Qur’an. The student will continue with their memorisation of the Qur'an and will be encouraged to memorise the poem Al Jazariyyah by heart with close monitoring for accuracy and fluency. Students in the Hifdh School will be reading the Qur’an in every lesson with the aim to complete a "Khatam" every two to four months (depending on the chosen programme of weekday or weekend). They will have highly skilled teachers who will be able to bring out the natural melodious tone unique to each child to aid their memorisation. 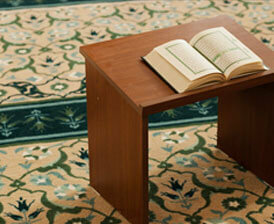 Rules of Tajweed will be covered orally through correction and the memorisation will be monitored for accuracy. The Hifdh School aims to complete memorisation of the complete Qur'an within two years. All our students will receive a certificate from Al Haramain Qur’an Schools signed by the Imam of Madinah and have the opportunity of obtaining Ijazahs (certification/licence) for memorising the entire Qur’an. All students will be assessed at the registration days and assigned class rooms according to their ability and age. Throughout the course, students will be tested individually based upon their general understanding and participation in class. The Al Haramain Schools advanced students and parents’ portal will be an essential tool to update parents on a daily and weekly basis with regard to their child’s progress and other key information. All parents will receive reports towards the end of each term based on the teacher’s observations and test results. A registration is a parent/guardian's full commitment of 1 year (10 months) at Al Haramain Qur'an Schools. We accept payments by cash, cheque or direct debit/bank transfer. Fees include tuition fees, course materials and Al-Haramain Qur’an Schools bag. Continuing students shall receive a discount of £100 per child on the second year. Payments must be paid in advance, and it should be noted that, for parents paying 2 months’ deposit on the monthly payment option, this will go towards the last 2 months of tuition and will not be refundable. Failure to pay fees on time will result in loss of deposit and increase the risk of losing your child’s seat. Contact us today. Find out more information to help you make your decision in picking the best course for your child.